Beautiful surroundings for outside dinning on the terrace overlooking the reach, listening to the sound of the river that runs under the mill. The 11 x 5mtr swimming pool is heated and the swimming pool area is surrounded by a wall, to keep the wind out and maintaining the safety of your children. There are plenty of sun loungers and dinning options outside and a large ping pong table under the summer house for family fun. A large private fishing lake is also available for the fishermen and the others who wants to discover the pleasure of fishing. Inside there is a large living room / kitchen and dining area, with an original fireplace where you can have your meals with the entire family. The mill offers you five comfortable bedrooms (sleeping up to 9 people) comprising 3 king size beds and 3 single beds, four bathrooms (one with a bath) the rest having shower enclosures and four toilets. Wonderful mill house, great location! Our two families (4 adults and 6 kids) stayed at the mill for week at the beginning of August. It was perfect for us. The house is very well appointed, with everything we needed. The large pool was well used during the hot afternoons, and the kids enjoyed catching fish in the pond in the evenings (while the parents sat on the patio with a glass of local wine...). The kitchen had all the necessary equipment and the beds were very comfortable. The house was large with more than enough space for everyone and set in a quiet valley. The regional location was great - 5 mins from the quaint medieval town of Sarlat with its stores, markets and evening dining. Getting everywhere within Perigord (Lascaux, Domme, Beynac, etc...) was easy so we didn't spend too much time in the car. Importantly the owner would respond to our questions immediately, and was very helpful. Great place, well managed, highly recommended! We had a delightful stay at the “Moulin” and recommend it highly. The Moulin de la Borie is a magical home surrounded by woods, meadows, green fields, streams and small lakes. We chose this well restored and tastily decorated water mill for our family reunion of three generations. Each one had a separate floor with bedroom, bathroom with shower and WC which made us quite comfortable, private but close by. Although nestled in the country side we were close to baker and butcher (5minutes drive) and Sarlat supermarkets (10 minutes’ drive). The modern pool (heated on our request) kept the younger generation fully occupied and exercised while the older could enjoy the proximity of Sarlat with its café, restaurants and many shops. The kitchen and dining room with outdoor dining terrace and barbecue were well equipped (even with expresso machine) to entertain the family (7 of us) and extra visitors. Our English heritage made us wish for one or two teapots to complete the fine dining china. No doubt, had we had requested one, our very friendly hosts Cathy and Patrick would have rushed to fulfill our wish. merci à très bientôt en Périgord. 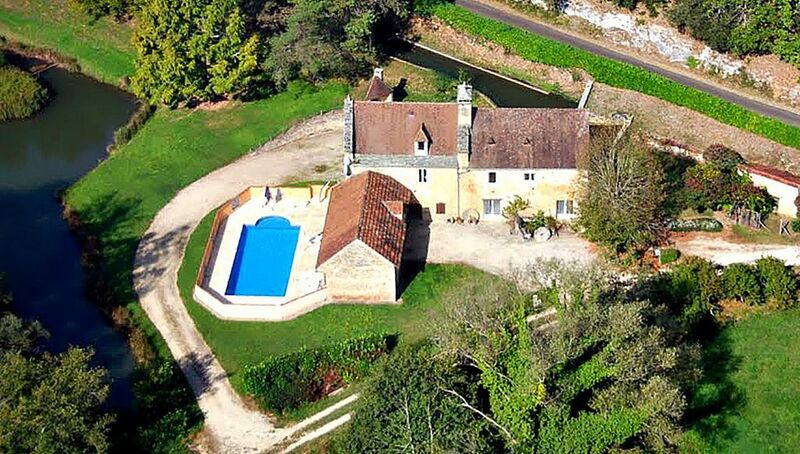 Tout est réuni pour passer d’excellentes vacances : grande maison magnifique, propre et très bien équipée dans un cadre idyllique en pleine nature, idéale pour une grande famille ou plusieurs couples car en tout il y a 4 salles de bain et 4 wc, superbe piscine très bien entretenue et à l’abri des regards. Aucun voisin à proximité, aucun bruit autre que celui de la nature. Propriétaires au top, très réactifs et sur place en 10 minutes au moindre problème. Quelques petits cadeaux gourmands à notre arrivée ... Tout cela situé dans une région magnifique !!! Que demander de plus à part y revenir très vite ! Je vous remercie pour toutes ces gentils compliments. Pour nous, il va de soit, que si nos hôtes rencontrent des problèmes nous nous devons de faire au mieux pour les aider à les résoudre. Nous sommes ravis que vous ayez passé d'excellentes vacances, bonne reprise, bon courage et peut être à bientôt. Superbe Moulin dans la nature! Wunderbares Anwesen mit allem Comfort und unkomplizierten Vermietern. Thank you we are happy you have a nice time in our watermill in Sarlat. (Text automatically translated) only 5 km from Sarlat and 60km from Bergerac. Ideally situated for visiting castles, caves and all our beautiful villages not to mention our good restaurants.